Journaling, commonly known as a journal writing consists of a short writing practice that can be continued day to day. Keeping a journal has become very popular in the mental health community for its therapeutic use during treatment. Journal therapy helps clients keep track of their emotions, thoughts and situations through documented exercises and prompts. The use of a journal creates a reflective environment and helps clients voice concerns or things on their minds. Therapists have been increasing their recommendations of journal therapy in recent years thanks to the long list of benefits supporting it. One of the initial things that attract therapists to endorse journal therapy is the ease of set-up and ability to guide clients between sessions in writing about specific things. Journal therapy helps clients capture emotions, analyze concerns and commence a dialogue with themselves, which helps their therapist to decipher what’s been going on outside of sessions with the client and their condition. Still not convinced?! Let’s explore the science behind journaling during treatment. Journal therapy alone won’t cure a client’s condition, it’s the treatment as a whole that helps for a steady recovery. However there’s a number of ways how journal therapy supports treatment by uncovering a wide variety of concerns of clients. A study of the benefits of writing from the Journal of the American Medical Association (Vol. 281, No. 14) showcased that there’s more to journal therapy than meets the eye. 107 patients suffering from asthma and rheumatoid arthritis wrote for 20-minutes on each of three consecutive days, 71 of them covering topics of stressful events and the 37 remaining covered emotionally neutral subjects of their day plans. The next 4 months after the writing exercise, 70 of the patients showed improvement on objective, clinical evaluations. In addition, those who wrote about stress improved more and deteriorated less, than controls for both diseases. “So writing helped patients get better, and also kept them from getting worse,” says Smyth. Extensive studies continue to show the benefits of writing about your experiences during the day. A study from the University of California took 20 volunteers to a lab for a brain scan. Before this scan, the volunteers were asked to spend 20-minutes per day writing, for the four days before the scan with 10 of the candidates writing about an emotional experience, the others about something neutral. The science from the brain scan proved that the emotions-lead writing experience induced relaxed neural activity in the right ventrolateral prefrontal cortex (element of the brain). One more extensive study showed the effects on recovery. The study in 2003 found that 76% of adults who spent 20-minutes a day journaling three days consecutively before a medical biopsy were healed in full 11 days later. Meanwhile, 58% of the control group had yet to recover. The results indicated that with just one hour of writing about an emotion experience helped candidates to reduce stress levels and understand the events of the situation. So, your clients are open to engaging with a journal. Where do you start?! This is great news! 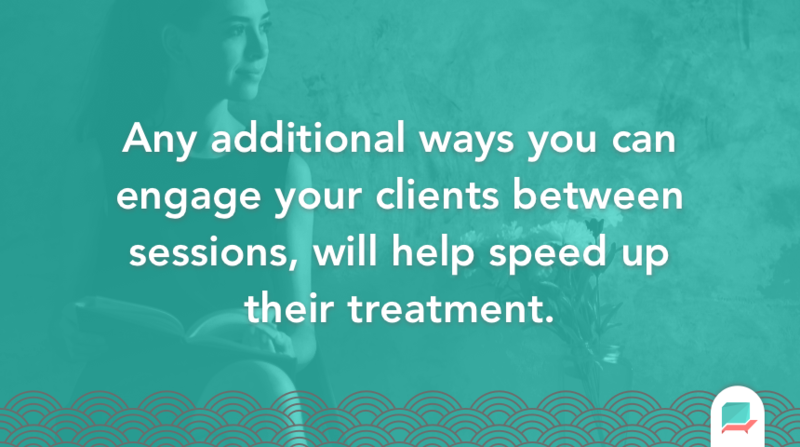 Any additional ways you can engage your clients between sessions, will help treatment. The positive thing about journal therapy is it takes many shapes, so the act can be used in a multitude of different ways. Many therapists like clients to use journal therapy for their out of session time. Having clients start their therapeutic writing experience when they have the time, can promote journaling to become a positive, healthy routine. Start by recommending the inclusion of journal therapy during sessions. Explain the benefits of how therapeutic journaling has improved many treatments and increased the longevity of the recovery post-therapy. Introduce an initial piece of homework. Between sessions set your client a 10-minute writing activity to kick things off. 10-minutes is a healthy-sized introductory period of writing they can get started with. Each session review the act and benefits of journal therapy. Re-evaluating, why this is beneficial practice, will increase homework compliance and engagement rates with your client. Set more complex homework exercises that will test their insights. Activities like this will promote in-session discussions and cement their commitment outside of sessions. You can find recommendations listed below. Don’t hesitate to add a digital tool to the mix that can help both you and your clients practice journaling. With Therachat you can send your clients journal prompts at any time and your clients will be reminded to do so. A tool like Therachat will also show you the journal entries immediately so you can follow along with your client in realtime and use that info to have more effective sessions. So, now you’ve started out with a basic practice of 10-minutes. You’ll be looking to ramp up your use of the practice with your clients outside of therapy sessions. Remember, keeping things relevant and interactive with clients will keep them progressing towards their end goal. Routine Entries – The first and easiest practice is to ask your client to set a time aside every single day that they can add to their journal. A routine practice will help to improve the more advanced exercises but help to build your clients confidence around the topic of journaling. Setting a limit of 10-20 minutes of emotional writing will help to get things started as they bring this into treatment. Letter Writing – The act of letter writing can be a good way to start a journal entry. Writing letters to the people in your life that you have an emotional connection with can help to release stress and promote reflective practices. This is something to discuss with your client and work out whether it is suitable. Positive or negative entries will help express your emotions. Dialogue – Using dialogue can help to promote awareness of other people’s state of mind. Asking your client to take the role of someone and writing about how they would react can help to create a two-way conversation that the client can review and be aware of emotional reactions. This can promote social learning and help anxiety as they try to change perspective. Photo Entries – Using photographs to start an entry can be a great way to write in an emotional manner. 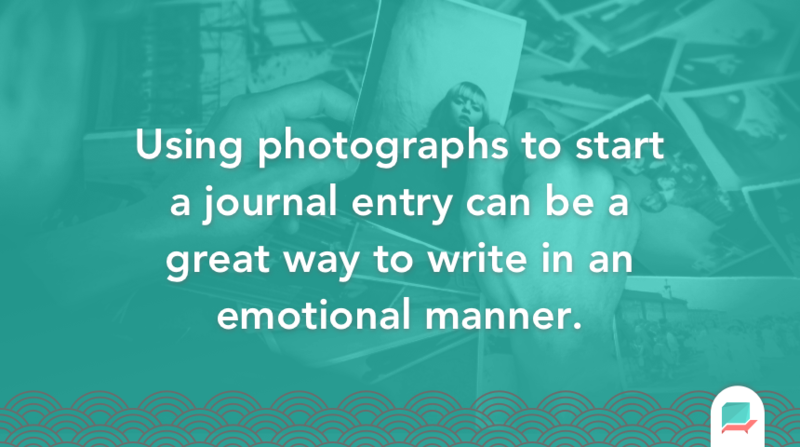 By having a photo to speak to in your journal can help bring up emotional situations. Maybe it’s a positive photo that you can share about how you felt in that current state or one that makes you feel pressured or anxiety, all of these will help produce a reflective piece of writing. Prompts – An easy way to get your client started. Bringing a range of prompts for their journal can help them to answer complex emotional questions without much hassle. Prompts like “The happiest times in my life have been…” or “The most emotional day of my life was…” will help to test their emotional state and get the ball rolling as they start out. Listicles – One that doesn’t take too long but many clients enjoy, starting a listicle. Asking a client to list the “Top 10 Things They Like…” or “The Top 100 Things They Hate” can help them to list one word or short sentence answers and flag many issues they are having. Being grateful or providing issues in this format can provide you as the therapist a condensed list of talking points with your client. The act of therapeutic journaling will take time to master and your clients will start to benefit across a longer period of time. Like many studies show; the extensive use of journaling can help and promote recovery, so keeping it in the client’s mind as a healthy routine practice will boost outcomes. A final recommendation would be a read by the author, Kate Thompson. Her book, Therapeutic Journal Writing: An Introduction for Professionals is one of the best recommendations for those looking to further understand this topic and how they can endorse the practice with their clients. On a final note, journaling can provide so much to your clients. Reviewing it as part of your practice will become one of your best decisions of the year and integrating as part of your homework compliance will help to arrive at your client’s destination with a stronger footing. Let us know whether you’ve used journaling in therapy. We’d love to hear your stories about what has worked, what hasn’t and how you go about endorsing the use of journal therapy.